this post is a bit overdue, but better late than never. i've been meaning to introduce you to someone. last sunday while out on the town i ran into atena, a dear friend of mine and fellow blogger, the gal behind beau bazar. 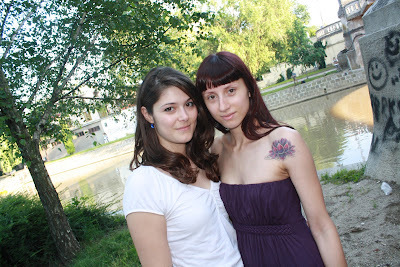 we immediately jumped the chance to take some photos together, cause that's what bloggerinas do :). she's so much fun to be around, a very happy and optimistic person, very chic and creative. all these things are quite well reflected in her lovely blog where she talks about fashion, design, beauty, vacations, food and more. it is truly a bazaar of all things beautiful. make sure you pay her a visit.